The Ukraine courts are still dependent on political authorities, and the special service is used to carry out political schemes and to fight inconvenient points of view and dissent, rather than to protect national security. — Imprisoned Ukrainian-Russian journalist Kirill Vyshinsky tells Eva Bartlett. KHERSON, UKRAINE (Interview) — Ukrainian-Russian journalist Kirill Vyshinsky has been imprisoned by Ukraine since his May 2018 arrest on yet unproven allegations of “high treason” and of conducting an “information war” against Ukraine in his role as chief editor of RIA Novosti Ukraine news agency. 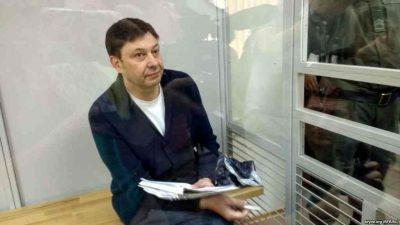 To date, Vyshinsky has not been allowed a trial, the Ukrainian authorities instead repeatedly prolonging his pre-trial detention and delaying his right to justice. In November, 2018, I spoke with journalist Vladimir Rodzianko about the case of Kirill Vyshinsky. In our interview, Rodzianko explained Vyshinsky’s May 2018 arrest, Vyshinsky’s work as an editor, the absurdities of Ukraine’s accusations against Vyshinsky, and the lack of outcry on his imprisonment. Through intermediaries, I was later able to interview the imprisoned journalist, via email. While his replies came at the end of 2018, my intermediaries just recently were able to provide a translated transcript of Vyshinsky’s words. More recently, I went to Kiev to interview Vyshinsky’s defense lawyer, Mr. Andriy Domanskyy. That interview will be published in the near future. While conducting the interview with Mr. Domanskyy on February 19, he received a phone call from the Kherson Court informing him that during the February 21 pleading, the court would limit the time during which Vyshinsky and Domanskyy could read the case files–case files amounting to 31 volumes. Below is my correspondence with Kirill Vyshinsky. Eva Bartlett: What do you believe was the motivation for the Ukrainian authorities to arrest and detain you? Second, from the very first hours of my detention, without a trial and even before pre-trial restrictions were set for me, high-ranking Ukrainian politicians started talking about the need to swap me for a Ukrainian convicted in the Russian Federation. Swaps are a favorite PR topic of the current Ukrainian government, which, in the past five years, has been unable to accomplish anything to benefit the country’s economy, achieve peace in Ukraine, or resolve the civil conflict in Donbass. This government did nothing to improve the well-being and safety of its citizens, so it was looking for other ways to score electoral points. Anti-Russian hysteria and PR around a prisoner swap is one such way. EB: Had the Ukrainian authorities harassed you prior to May 2018? against me in the case investigated by the Ukrainian Security Service (SBU) are connected with posts on the website that I run dating back to the spring of 2014. The posts were made in the spring of 2014. According to the SBU, they represented a threat to the national security of Ukraine, but they remembered them only in 2018! And this is despite the fact that the SBU and Ukraine’s Ministry of Press and Information (another supervisory authority) have been regularly publishing lists of websites that were a “threat to national information security,” while my website was never listed!! And then, in May 2018, I was arrested. EB: The authorities accuse you of “treason”. How would you counter this? What had you been covering in Ukraine? From the vast number of texts that were published in the spring of 2014, the SBU picked only about 15 that they deemed “treasonous.” They simply ignored other texts with other views posted on our website and accuse me of conducting “special operations.” Again, they accuse me of conducting an “information war” for the mere fact that we posted a variety of opinions on our website. What does the fact that I impartially let people speak in support of Maidan or against it have to do with special operations? As for the events that I covered, ours is a news website, and we post many texts on social and political issues. None of the texts that are included in the SBU files were written by me. I’m accused of providing an opportunity to speak about the situation in the country to people whose opinion is inconvenient for official Kiev. That’s all there is to it. EB: How did your coverage of the proposed autocephaly for a ‘national Ukrainian church’ influence your detention? KV: This is the most absurd accusation! This is the only episode from 2018. We posted a news piece on our website, in which Ukrainian political scientist Dmitry Korneychuk expressed skepticism about the possibility of granting autocephaly [a form of self-governance exceeding basic autonomy] to the Ukrainian Orthodox Church. The same news piece included the point of view of the Ukrainian Orthodox Church, which has argued for the need for autocephaly!! It was a classic piece of journalism providing two points of view, for and against, where the reader has to decide which one is more credible. However, the SBU believed that posting this material was part of my personal war against the autocephaly of the Ukrainian Church!! I read this text out more than once in court. In it, the view “against” autocephaly takes up 11 lines, whereas the case “for” autocephaly is laid out in 17 lines, and I’m being accused of conducting a special operation against Ukrainian autocephaly! EB: How have you been treated in prison? Do you have access to doctors? How has your health been since in detention? Are you allowed visitors and if so, under what conditions? KV: I consider the prison conditions to be tolerable by Ukrainian standards, although access to medical care is quite limited. The prison medical unit was downsized, and I had to wait for a specialist doctor appointment for months. To alleviate acute neuralgia pain, I was given …diphenhydramine! It’s like treating acute heart pain with vitamin C. It won’t make things worse, but it doesn’t do much to help, either. I feel pretty good right now, but this is definitely not due to the prison medicine but to the efforts of my lawyers and the medications they passed me. Once a month, my father comes to see me. We talk through a phone, separated by a glass partition. EB: How many times has your trial been delayed? What were the reasons given for the delay? Do you feel that you will be given a fair trial? KV: The issue is not about adjourned hearings, but the fact that the SBU keeps extending the investigation all the time, citing the need to conduct some kind of expert analysis in addition to the one that is already filed in the case. That is why I have been in jail for seven months now. The charges are absurd, the evidence does not include any text that was written by me, but the SBU is acting upon a political order issued by the Ukrainian authorities, which is to keep me in prison while the authorities try to net some political dividends from my arrest. It has nothing to do with justice. They just want me in prison. EB: Have any international bodies supporting journalists, or any international human rights organizations, been in contact with you about your imprisonment? KV: Yes, the UN Monitoring Mission in Ukraine and the Red Cross office in Ukraine visited me. Representatives of the OSCE [Organization for Security and Co-operation in Europe] mission regularly attend my court hearings in order to stay up to date on my case. Several international journalism organizations — such as the European Federation of Journalists (EFJ), the OSCE Representative on Freedom of the Media, the Press Club Brussels Europe — my colleagues from Russia, and many friends spoke in my support, and I thank everyone so much! I am counting, primarily, on moral support and the ability to get as much information out about my actual case as possible, as opposed to what is published in the Ukrainian media at the behest of the SBU. EB: Do you have any message you’d like to convey about this entire ordeal? KV: My main takeaway from the past six months is huge disappointment in the level of political power in Ukraine and the state of its judicial system. Despite declarations about Ukraine’s “European choice,” the courts are still dependent on political authorities, and the special service is used to carry out political schemes and to fight inconvenient points of view and dissent, rather than to protect national security.